It's late autumn, garden make-over time. Day temperatures are still pleasant, the soil isn't too frosty for digging, and the mellow light quality helps the gardener to see things optimistically. Summer's perennial fluff and froth has evaporated, and the shapely deciduous trees are close to baring all. Some roses are flowering on, but they don't fill up the spaces as they did. The garden looks gentle, expectant, and encouraging. 'Improve me. Go on. You know you can.' Thus whispered the Glass-House Garden to me as I wandered past on an early autumn morning dog-walk around the garden. I've known for a while that the Glass-House Garden hasn't been quite 'right'. It needs a central focus, particularly in the colder months when the roses are resting. And it needs some sort of theme, to tie things together. 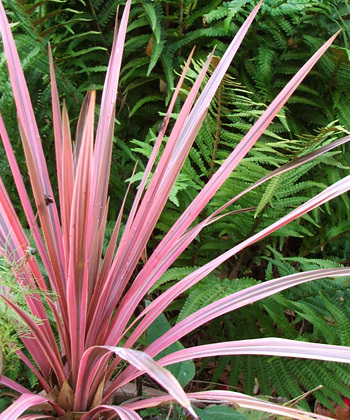 In the past I've tried small trees - a native red Ake Ake (too scruffy), a red Maple (battered by the wind), and the classic trio of red Cordylines. They looked contrived and silly, and then turned dull brown. Not good enough - out they came. The shrubby lilac Lavateras were worse. Such good fillers, I'd read, for gardeners on a budget. Hmm... They looked extremely budget! This autumn I have another batch of good ideas. I'll shift a little Crab-Apple called Barbara Anne from the wilderness behind the pond. 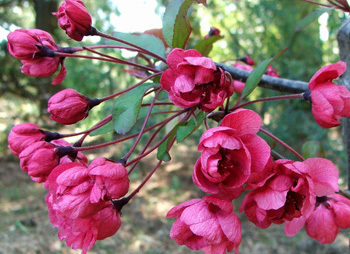 It will easily go in the centre, and has beautiful deep pink spring blossom. Hmm... I'm now looking at a beautiful little pink and red leafed Coprosma, stuck in a pot for who knows how many years. Maybe he would like to escape into the Glass-House Garden? Towards one corner - he would make a nice colour link with the red Phormiums by the water. Aargh! Brilliant! Aha! It seems I now have a coloured foliage theme. I am going from strength to strength. But trying to do the 'right thing' design-wise is exhausting - I need a hot cup of coffee. It's done! All the plants mentioned above, plus the rose Whisky Mac, have been mentally shifted in. Easy, peasy! 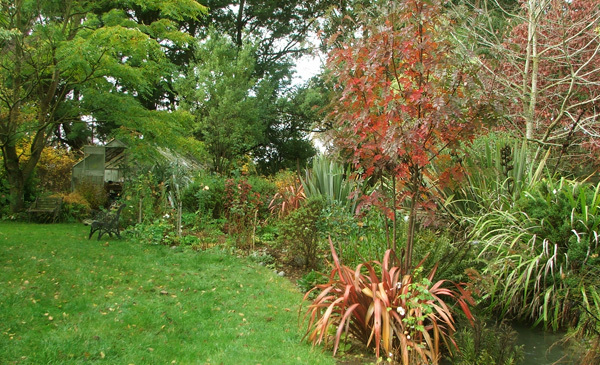 They are thriving, with warm red foliage a lovely link throughout the garden. After extreme mental exertion (and much virtual grunting) both pots are in position. Inspired, commanding attention like happy exclamation marks! Thus I've just completed THE perfect ultra-high definition garden make-over of the Glass-House Garden. Not one gardening knee got the slightest bit muddy, the digging shoulder didn't ache, and the coffee didn't even go cold. Blast! The pots were too heavy for me to shift. I need Non-Gardening Partner's man-muscles, or a sack-barrow, or both.